Having a website is an intangible, yet an ever-important extension of your company and brand. It is quickly becoming a cornerstone of small business success. In 2016 however, a Clutch.com survey of 350 small businesses suggested that just over 50% in the U.S. had created a functioning website. When asked why they did not, industry relevance and cost were the two most common responses among participants. Let’s face it, having a website in the current business environment is absolutely essential for all companies large and small. But how do you decide what website creation experience is right for your small business’s functions, and how do you avoid paying more than you want or need to? Its no secret that business is quickly shifting towards the online realm. Many businesses are shifting from just brick-and-mortar locations, to either click-and-mortar or even entirely online. This is due to changing consumer buying habits in accordance with the seismic shift of technology from a mostly professional tool, to an integral and omnipresent facet of our everyday lives. 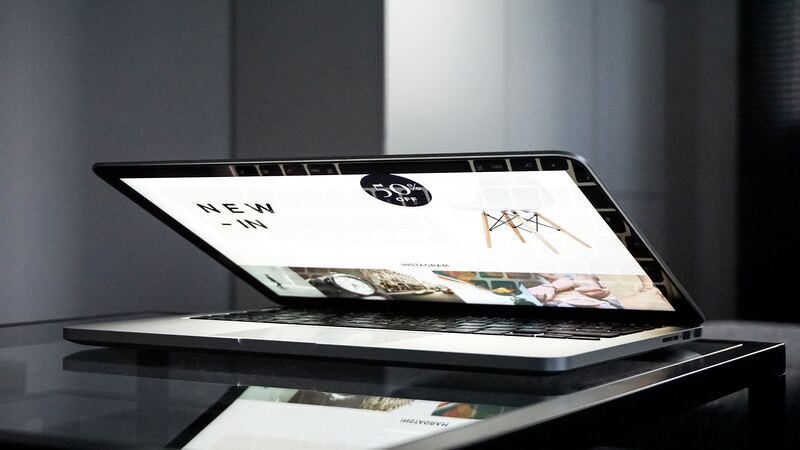 For many small businesses however, the perceived cost of an integrated website that houses a robust back-end suite was far too expensive to yield a cost-benefit. This doesn't have to be a concern for you. As a small business owner, you really have far more creative control over your potential website then you may realize. Let's start by looking at some statistics and considerations to keep in mind when you decide to make the jump and take your small business to the online realm. As mentioned above, the number of small businesses with a website was hovering around 50% in 2016. By the March of 2017, Clutch.com found that 16% of the surveyed businesses created a website by the end of the previous year. That is quite an upsurge in just one year. This brings the number of small businesses included in the survey up to around 75%. Still, over a quarter of the respondents to the Clutch.com survey in 2016 stated that they had no plans to shift online in the future. 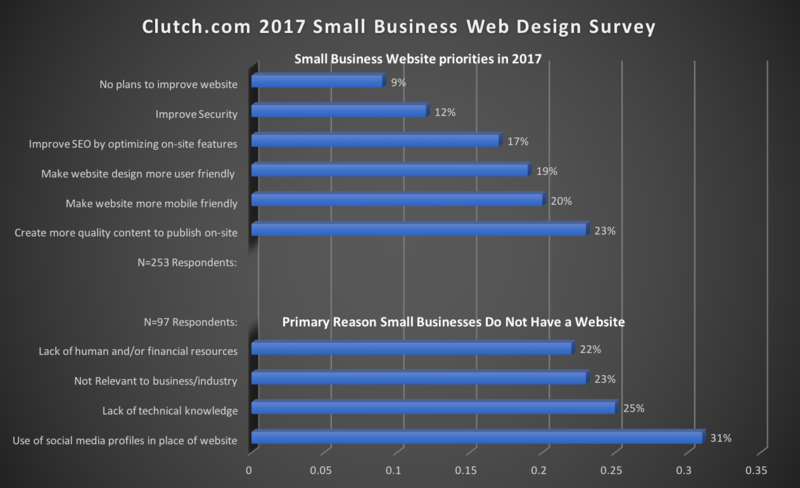 While this is a sample survey, it is very surprising that still so many small businesses are resistant to the idea of a website. Why does your small business need a website you ask? Well, Indexing your business name and information in a search engine will go a long way to help keep your business in the consumer's consideration-set. This is important because about 80% of Americans cite the internet as their primary source for conducting research before purchasing a product or service (you're doing this as I speak). Having an online presence can help you stay in touch with loyal customers, as well as increasing your reach to help attract new customers. A 2016 Pew study found that 80% Americans are now online shoppers, and about 15% of U.S. consumers make an online purchase every week. Of the small businesses that do have a website, about 17% of these are still not compatible with mobile devices in 2017 according to the survey. Having a mobile adaptability is a major prerequisite for proper search engine optimization (SEO). Since technology has become so omnipresent, mobile devices are becoming the tool of choice for web browsing. Over 75% of people open most of their emails on their phone as opposed to their laptop or desktop. This has caused a huge drive to not only create a website, but to ensure it can adapt to mobile screen sizes. In 2015, Google ensured this with a system patch-over that “punishes” certain searches if they do not have a mobile-friendly site. Simply put, if you plan on optimizing the reach of your website by appearing on a Google search, you MUST have mobile compatibility. There has been a proliferation of CMS (also called template) website builders in recent years. This could either be seen as a response to many people’s perception that web developers charge too much, or simply due to the demand for more proprietary autonomy in web development. This is because these sites utilize a Content Management System (CMS) which allows for businesses to easily update their site without advanced technical support or the knowledge of how to write code in most cases. Some examples of these CMS sites are Spacecraft, WordPress, Weebly, Squarespace, Wix, and Jimdo to name few. Pricing plans with CMS sites can range from completely free (for the most basic features), to about $50-$300 per year (in aggregate costs for monthly plans including cloud storage and analytics etc.). To be able to optimize your website, you will most likely want to invest in the monthly plans offered by these CMS-run sites. Sites like Wix and Weebly are totally template-based. This means that the web design coding is pre-written into easy-to-use, pre-fabricated templates. The sites generally follow a “drag-and-drop” design. You choose a layout based on your desired website function, and populate “containers” with text, images, and other styling widgets. This makes them an easy introductory web design experience for a small business. Not only are they extremely economical, but you can create one from your laptop at home with little to no help. While they are working on offering more plug-in capabilities, there are some downsides to how flexible these CMS builders can be. The obvious parameters of templatization makes CMS sites quite limiting in terms of truly customized content offerings and plug-in flexibility through the back-end suite (the real engine of the website). There is also a higher potential for malware attacks due to the template based code that makes it relatively easy for hackers to create and insert malicious software. 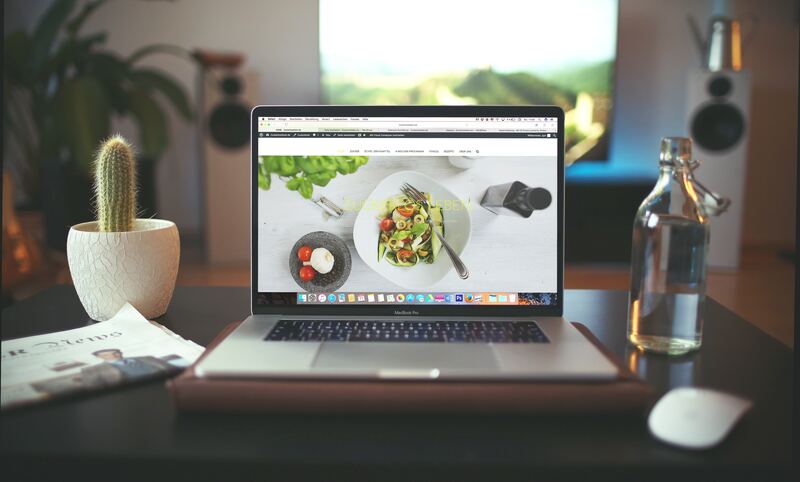 In most cases however, these options may be the way to go if you simply want to have a placeholder site on the internet to upload a restaurant menu, store hours, or a few webpages of information about your company so that people can more easily connect with your business. That being said, it is totally up to you to decide what degree of customization you want for your business. This will be your most affordable, easy web creation experience, but it is not without the aforementioned limitations. You have most likely been to a handful of WordPress powered sites just in the last couple of days. I figured I would mention WordPress in its own section since about 30% of the internet's websites are hosted on WordPress. In addition, about 60% of all CMS websites are WordPress sites. This is because WordPress is somewhat of a “double-agent” in the world of web design. By far the most flexible big CMS site, it occupies a unique niche between template and open-source sites. This popularity is due to its offerings in both a template designs, and open-source (where HTML and styling code can be written by anyone) option. It is not as customizable as some framework based sites, but can cover a large spectrum of potential customer or proprietor needs. There is also a robust application programming interface (API), and fluid overall functionality. Many reputable brands with high-traffic websites use WordPress for their CMS. Some of the popular sites that use WordPress are TechCrunch, The New Yorker, BBC America, and Sony Music. This just goes to show the power of a site like WordPress. There is the template functionality allowing for easy everyday updating for news like press releases, but also the ability to insert coding and add some deeper degrees of customization. If you should choose to use WordPress however, you may want to be ready to pay for the services of someone who knows how to write some design code. This will allow you to get the site that you want aesthetically, and also provide you the ability to manage content for daily updates. There are some disadvantages to WordPress as well. As with the other CMS sites, WordPress is also vulnerable to cyber attacks due to the open-source nature of the code. This can also be a problem because of their MySQL (a database management system) backend that is prone to malware and cyber attack due to wide usage. In addition, you will likely be using plugin applications to perform functional activities and collect analytical data like page views and other visitor information. Plugins are usually essential for small businesses as they alleviate the need for many previously-paid human jobs. This helps to cut back on cost and also allows you as a small business owner to see a more holistic view of your company performance with your online shift. The downside here is that some of the excess plugins you will likely be using may hamper site functionality and load time, in turn detracting from the visitor experience. These are just some of the issues facing WordPress, but for small businesses, it may be the best of both worlds despite not being perfect. You will have to pay for a domain which could be under $5 depending on the demand for your desired domain name. WordPress officially recommends hosting on Bluehost, DreamHost, or SiteGround. WordPress also has the options for a basic free version, a $99 per year premium version, and a $299 per year business version with more advanced plugins. If you should chose to incorporate a designer to write code into your WordPress site, you could be looking at much higher costs, potentially in the thousands depending on the relative complexity of the project. If you are looking to create a website that is modern and truly powerful, you may begin looking to consult a web developer that works with framework sites. Many web developers see web design in the same way that a painter may view their art. You need two things: paint, and the canvas that you will be using. Consider a framework software the canvas that a developer will populate with their art. Code is the paint that is used to structure and style the framework architecture. Basically, there is nothing a master web developer cannot create for you using a framework site. Having a completely customizable website will allow your site to be far more unique and flexible, in turn allowing more ability for SEO. If you truly want to leverage your brand or company in the online sphere, hiring a developer is the way to go. The goal is execute an online experience so enjoyable it will reward you with a worthwhile ROI (whether that is through raising awareness, driving site/store traffic, or increasing sales). Make sure that all of the ideals of your small business are fused into this website as it is a direct extension of your physical store. The downside with this option being, if done correctly, this will also be your most expensive option by far. When it comes to web developers, there is generally a strong correlation between price and deliverable. You get what you pay for, and the cost curve follows these talent tiers. Be aware of some things when scouting a web developer. Developers will often charge somewhere in the range $500 up to $5,000 for a solid website. Some bigger companies running a large e-commerce operation may get charged in the area of $10,000-15,000 for a very substantial, integrated site. Yes, you can have a site built for under $200, but this begs some questions. Why would a developer create a website for little? You need to think about this. 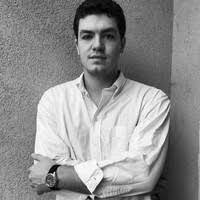 In fact, some designers even reported to lose customers if they did not charge a comparably high price because customers were wary of why they cost less than a competitor. Many developers also charge an hourly rate. If you are a demanding and exacting client, your site will take the developer a very long time to sort out of all of the desired features. You will end up paying hourly and even overtime in many cases. This being said, you do not want to be overcharged. Know what you need your site to do and let them know up front. While a site can help your business grow, you need to create your site as an extension of your business and what you can currently provide. If you are planning on opening a web store with fully integrated features and international order processing, you may want to consult some integration professionals so you can streamline your experience. This will help you provide a safe and secure experience for your shoppers as you expand your small business. The web-design process is different for everyone, but should follow a general structure. Trying to expedite the creation of your custom site development could end up costing you far more in corrective measures down the road. You want to be an active participant in every stage here because this is likely a big investment for a small business. If you are willing to make the investment, try to find your ideal web design partner and stick with them. Most of these developer or framework softwares do not have any type of CMS, and therefore, they must be maintained by the developer. To manage these sites you would need to be fluent in HTML structuring, CSS, and Python, PHP or Ruby (among others) code language with some frameworks. 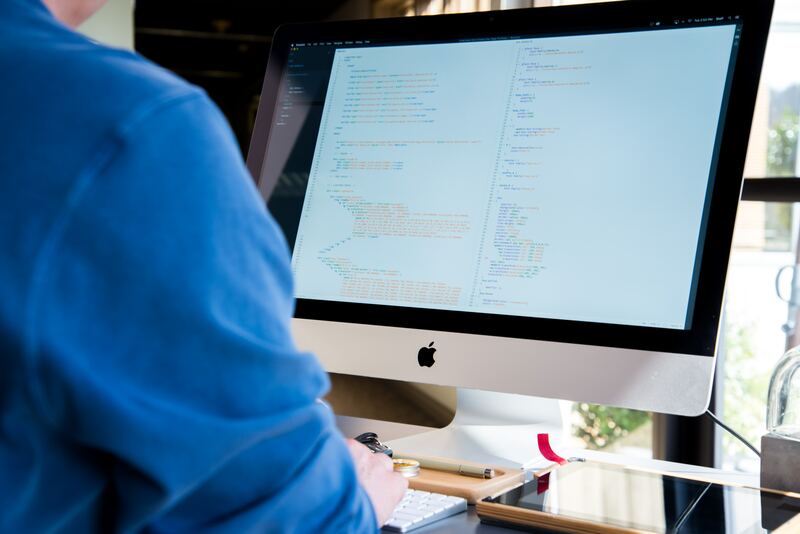 Although you as the small business owner will likely not have an opinion either way, these are some popular frameworks that are the preferred tool of many developers: AngularJS, Laravel, Ruby on Rails, Django, and Symfony. You may want to check some of these out so you get an idea what your developer may be working with. As business shifts online, you want to be able to remain a competitor that can evolve the way you sell. Advances in fintech have made it so much more secure and simplified to provide an inviting online experience from small business vendors to their customers. Whether you simply want to expand the base of people who know your name, provide informative content to potential customers, or begin to sell your product online, you are going to need to have a website that is integrated with the features to accomplish your goals. If you ever feel like you are being overcharged, remember that there is always the option to use a CMS website. Like everything, working with websites will get easier over time. Take this information and decide which experience will be right for you. It’s time, get out there and make your first site an asset to your small business!